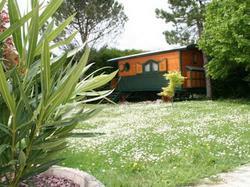 Set on a 2000 m² garden, Antre Terre et Mer ? Roulottes is located in La Jarrie and 15 km from La Rochelle. It offers free Wi-Fi, a partially covered swimming pool and a terrace with outdoor furniture. All the heated caravans feature a flat-screen TV, a seating area and a private bathroom with a shower. They are air-conditioned and 1 of them has a private terrace. Guests are invited to enjoy a daily continental breakfast with homemade jams at Antre Terre et Mer ? Roulottes. Each caravan has a minibar, an electric kettle and a coffee machine. This property is 11 km from Châtelaillon-Plage and a 20-minute drive from La Rochelle Train Station. Bike rental and free private parking are available at the property. Please note that the 30% prepayment by cash, cheque or bank transfer is due before arrival. Please contact the property in advance to organise this. This caravan offers free Wi-Fi, a seating area with a flat-screen TV and a private bathroom with a shower.